It should have been the world's first full Ring on LP - Furtwängler's Die Walküre the first of the four operas to be recorded by EMI, in mono (would they have remade it?) in the autumn of 1954. Two months later the conductor was dead, his most ambitious recording plan barely begun. EMI duly released the LPs, to the response reprinted here, and music-lovers were left to guess what might have been, their what-ifs only further amplified by the two live Furtwängler Rings that have trickled out since. 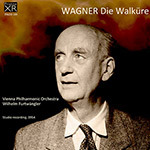 This XR remastering shines a whole new light onto the Furtwängler Walküre, stripping away the years and embuing it with a sense of life and depth that makes the original 1954 sound seem flat and dull - it really is one of the most remarkable transformations I've heard using these remastering techniques. This Walküre offers moments as dark and as thrilling as you're ever likely to hear in a recording: from the moment the rosin starts flying off the double-basses in the opening Prelude to the blaring, then glowing brass in the music's dying moments, this Walküre is one breath-taking ride. This is the EMI studio recording made in 1954 that was supposed to be the first installment in a complete Ring cycle. The project was never completed because Furtwängler died less than two months after the completion of this recording. It has been reviewed a number of times in Fanfare, most recently by me in 30:4 when Naxos reissued it. Both Naxos and Urania have produced transfers on CD more satisfying than EMI’s, and the question here (at least for those who already know the performance) will center around Pristine’s work. As you might expect, it is superb, and certainly if you have the EMI version and enjoy it there would be ample reason to replace it with this. The Naxos transfer is also quite good, and if I find this more satisfying it would be hard to say that every collector will find the investment worthwhile in replacing Naxos with Pristine. For me there is a degree of color that Andrew Rose gets out of both the orchestra and the voices that surpasses even the Naxos, especially in the XR stereo version that is a specialty of Pristine. The changing world of technology has cast an interesting light on this recording in unexpected ways. As Furtwängler collectors know, there are two complete live Rings that have been in circulation in various guises for years: the Rome RAI studio broadcasts and the staged La Scala performances. When they first saw the light of day, the resulting sound quality ranged from dismal to barely tolerable. But over the years, reissues have consistently improved both to the point where they are much more satisfying. Clearly the Vienna Philharmonic, in a professionally produced studio setting where mistakes can be redone and corrected, is in a whole different league from both the RAI Rome and La Scala orchestras. Furtwängler generally disliked studio recordings, but one senses that he felt the significance of being asked to make what would be the first complete professional recording of the Ring cycle, and the performance here certainly has plenty of intensity and drama. But it is also true that it lacks the fire heard in the Scala Walküre. Now that the Scala cycle is itself well transferred by Pristine (there is also a new version that I have not heard yet from Eduardo Chibas at furtwanglersound.com) it remains, for me, the most thrilling of the Furtwängler cycles. But there are many wonderful things unique to this Walküre. The playing of the Vienna Philharmonic is at the top of that list, with a richness and variety of orchestral color not available to the conductor from the Italian orchestras. And this is certainly not a static, studio performance lacking energy. Rysanek and Mödl are actually astonishing in the commitment they bring to their roles, and all the singers are alert to nuances of text and music. Were there no live versions with Furtwängler available, or were they still only available in cramped and distorted sound, this would be mandatory for all serious collectors. As it is, it is perhaps more appropriate to say it remains an important recording, one that those interested in this conductor and repertoire will want to obtain. This article originally appeared in Issue 37:6 (July/Aug 2014) of Fanfare Magazine.